A restaurant, café or coffee house benefits enormously from a distinctive look. The vintage industrial design is an impressive and surprisingly simple to apply interior style that will leave a mark on your customers for certain. In this article you will find 6 simple to follow tips, as well as inspiration to create your own industrial interior. Industrial design is rising in popularity, not just at home, but also in restaurants and cafés everywhere. The way a restaurant or café is decorated is a determining factor in how guests experience a cup of coffee or a dinner. Not only that, but interior design is crucial for the customer’s experience of a restaurant or café as a whole. Here are some tips and inspiration to help you transform your place into a trendy, industrial hotspot as well. Usage of the proper materials is essential in creating just the right industrial look and feel in a space. In this article a number of different materials will be discussed and displayed alongside some inspirational photos. A trademark of the industrial design is, of course, the use of metal. This can be as rugged and applied as extensively as you like. Think, for example, of a robust and cool bar with metal plates, or even iron plates against the wall. Additionally, you can find a multitude of furniture that features metal, such as old locker cabinets or study tables with industrial frameworks. Do you prefer something more subtle? Then you can try steel accents in the form of metal barstools or chairs. When you think of an industrial building then coarse brick walls quickly spring to mind. Of course the dream is to build a sturdy brick wall, but there are plenty of cheaper and easier alternatives. You can, for example, get special wallpaper that has a brick motif in different colours and designs. Leather is one of the few materials that suits almost any style very well, but leather meshes extraordinarily well with an industrial atmosphere. Leather lends a vintage and tough character to a home or establishment, and can easily be combined with other materials such as metal and brick. 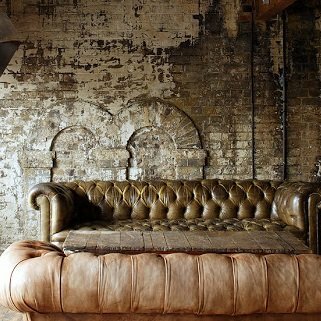 When applying leather to your establishment you can do so extensively in the form of a tough-looking, dark-leather couch or armchair. Alternatively, if you prefer a subtler approach, you can accentuate your industrial design with (fake) leather cushions or brackets. Provided the space allows it, placing industrial sliding doors is a great way to add that industrial character to your space. Furthermore, sliding doors are extremely practical: when you have fewer guests, you can simply use the sliding door to close off part of the space and create privacy for your customers. Playing with different materials is also a very valid option. Do you already have a lot of metal in your establishment? Then you can choose, for example, a rugged vintage wooden door so that the industrial atmosphere is emphasized without using too much metal in the design. Industrial lamps are hotter than hot and it is impossible to discuss modern interior design trends without them; when you talk about industrial interior, you talk about industrial lamps. Have you got nice, high ceilings? Then you should pick large, raw hanging lamps as an eyecatcher. But have you got a little less space? Then choose a great floor lamp or hang multiple lamps on longer cords, which creates a playful effect. An industrial interior can sometimes seem a little dark and cheerless, but that does not have to be the case! A few simple adjustments can easily add warmth to a space with an industrial design. Think, for example, of using light (make sure it is warm and soft light), which can completely change the atmosphere in a space or hall. Furthermore, it is important to add a splash of colour to the interior. You can do this in the form of cushions, rugs, and a bit of paint on the wall. Make sure to keep it simple, however. Another way to add warmth is by using fine, soft materials, such as a beautiful sheepskin on an armchair, or a cowskin on the floor. And a final tip: do not forget to use plants to your advantage!